Recent polls have confirmed that Americans are feeling bitterly split. A Gallup poll conducted just after the 2016 presidential election found 77 percent of Americans see the country as “greatly divided when it comes to the most important values,” up from 66 percent in 2012. A Washington Post-University of Maryland poll, conducted nine months into Trump’s presidency, found that seven in 10 Americans think the nation’s political divisions are as bad as during the Vietnam War (http://www.history.com/news/just-how-divided-are-americans-since-trumps-election). Americans now can see everyday the "hate things" such as "KKK, White Supremacist, Neo-nazism, Black Lives Matter, Fake News, Shitholes...". NEW ORLEANS (AP) — A man fatally shot in New Orleans has been identified as a Black Lives Matter activist known for his leap through police tape at a South Carolina demonstration last year as he attempted to seize a Confederate battle flag from a protester. A police officer answering a call about gunfire early Tuesday found Muhiyidin Elamin Moye, 32, on the ground, asking for help near the Treme neighborhood, about eight blocks from the French Quarter, according to a police report. He was better known as Muhiyidin d'Baha. Moye's family told South Carolina news outlets Muhiyidin Elamin Moye was his legal name. The report says a bloody trail to the body circled two blocks, and a bloody bicycle lay across the street. Moye was shot in the thigh about 1:30 a.m. and died in a hospital, New Orleans police spokesman Beau Tidwell said Wednesday. It was not immediately clear what led to the shooting. "No further information on this incident is currently available," police spokesman Gary Scheets said in an email. The responding officer saw a traffic camera and a car repair business's surveillance camera in the area, according to the police report. Officials did not say if the camera captured images that might help the investigation. Last February, a news camera recorded Moye jumping through police tape in Charleston, South Carolina, as he tried to take a protester's large Confederate battle flag before being tackled by police and arrested. At the time, demonstrations were going on outside a theater at the College of Charleston for a speech by Bree Newsome, an activist who climbed a flagpole and temporarily removed a Confederate flag from in front of the South Carolina Statehouse in 2015. DeRay Mckesson, a prominent figure in the Black Lives Matter movement, said Moye was a fearless, kind man whose death is a big loss for Charleston and the movement. He said they met in 2015, after the highly publicized fatal shooting of Walter Scott by a white North Charleston police officer. "He was a strong leader who deeply understood the role of community and the power of helping other people recognize that role," Mckesson said. Moye was taking a personal trip to New Orleans, niece Camille Weaver told the Post and Courier of Charleston. She told the newspaper that her uncle was born in Poughkeepsie, New York, and grew up in Hollywood, South Carolina, just west of Charleston. "He loved Charleston and loved fighting for what's right," she said. "I've never met anyone more committed and hardworking than him. He was an asset to the Charleston community and will be greatly missed." As word of Moye's death spread, members of the Black Lives Matter movement in Charleston, South Carolina, gathered outside of North Charleston City Hall. It was the same place Moye first made a name for himself with passionate speeches in the days after Scott, an unarmed black man, was killed by a white North Charleston police officer as he ran from a traffic stop. 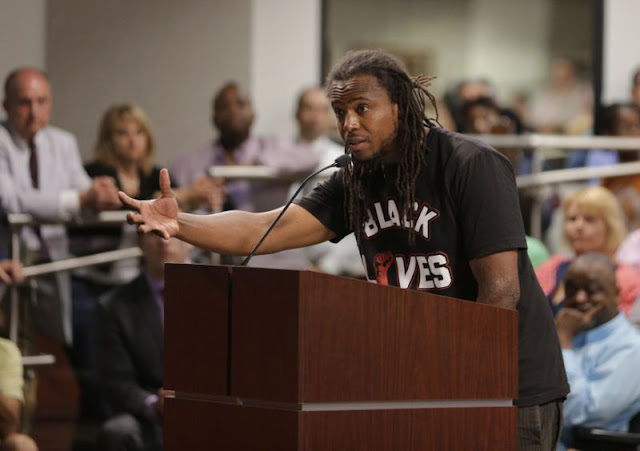 Moye would later interrupt City Council meetings to demand leaders change policies to give the public more power to assure police accountability. "What better place than where he actually catapulted the justice mission and message to the world," Thomas Dixon, a pastor and activist who worked with Moye, said of the place for the vigil. Another activist at the vigil said Moye is irreplaceable. "The intellectualism, the fire, the desire, the motivation, the way he rallied people in the city was just second to none," Johnathan Thrower said. Associated Press reporters Michael Kunzelman in Baton Rouge and Jeffrey Collins in Columbia, South Carolina, contributed to this story.